The library has more than 80,000 volumes including materials designated as important cultural properties and books ranging from antiquity to modern times. The collection contains not only Japanese books but also books from China and Korea. Wide-ranging collection of books is one of the main feature of Iwase Bunko Library. Generally, collections of personal libraries tend to be lopsided in favor of a specific field reflecting one' s preference and specialty. 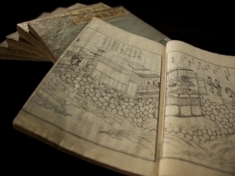 The collection of Iwase Bunko Library, however, contains materials in all fields because Iwase Yasuke collected books with an intention to open the library in the first place. There are especially many excellent books on history, literature, religion （Buddhism and Shinto）, natural history. The library has been conserving not only rare and valuable books and also modern general books. Now, we are very happy to show each collection of Iwase Bunko Library by high definition movie with curator 's narration(sorry, they speak only Japanese, so please find English texts) in 3 min. MotionVisualJapan inc. contributes to the establishment of this site for free. The official Iwase Bunko Library site is here.